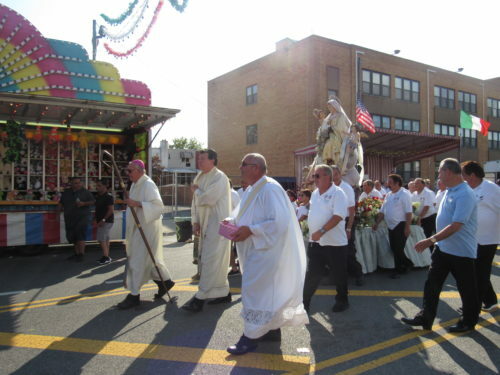 For the parishioners of St. Bernard Church, there is a summertime tradition that everyone looks forward to – the annual Our Lady of Mount Carmel feast for the entire Mill Basin community. Four, fun-filled days are spent on East 69th St., meeting with friends, listening to Italian music and enjoying delicious food. This late July gathering is in honor of Our Lady of Mt. Carmel, or Madonna del Carmine, as she is called by the Italian community, which has a great devotion to her. 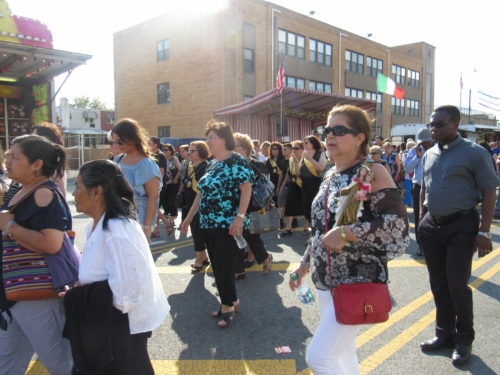 For more than a decade, the parish has hosted the feast which attracts hundreds of attendees from around the diocese and beyond to celebrate Italian culture and tradition. 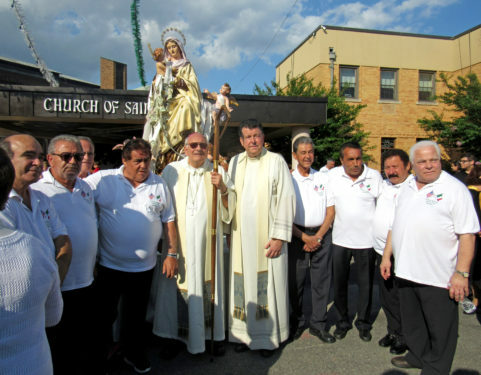 Helping organize the feast was the Gioiosa Marina Social Club, whose members return each year to represent their Italian heritage and pay homage to their patron. On the final night of the feast, Bishop Nicholas DiMarzio celebrated Mass in Italian and English to close out the festivities. The bilingual Mass is the crown jewel of the weekend, attracting faithful of all backgrounds to come together as brothers and sisters in Christ. Concelebrating the Mass were Msgr. Joseph Grimaldi, parish pastor, and Father Ebenezer Abban, a visiting priest at the parish for the summer. Assisting on the altar were Deacon Vincent LaGamba, who heads the diocesan ministry to Italians and parish Deacon Christopher Wagner. Bishop DiMarzio gave his homily mostly in Italian, but each member of the congregation fully understood his message no matter what language they spoke. 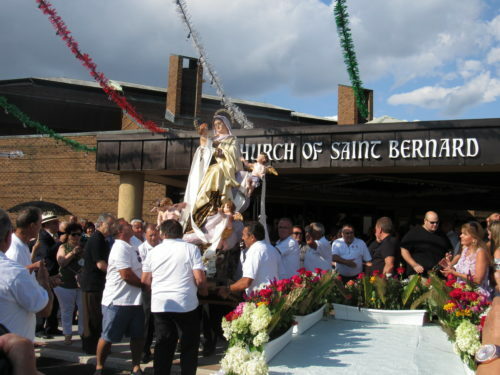 A procession followed the Mass in which a statue of Our Lady of Mt. 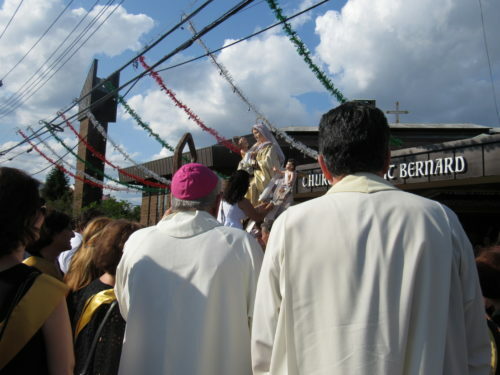 Carmel was lead around the neighborhood by Bishop DiMarzio, Msgr. Grimaldi, and of course, the Giglio Band, which is always a fan favorite. As they walked through the streets, the phrase “Viva Maria” was shouted as attendees, young and old, tried to catch a glimpse of the magnificent statue. 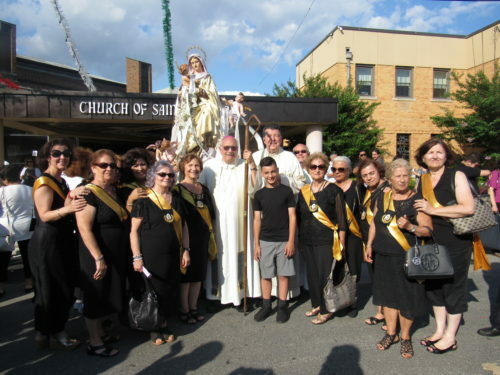 Even in the heat of summer, many joined the procession in appreciation of what the Blessed Mother has done for them. 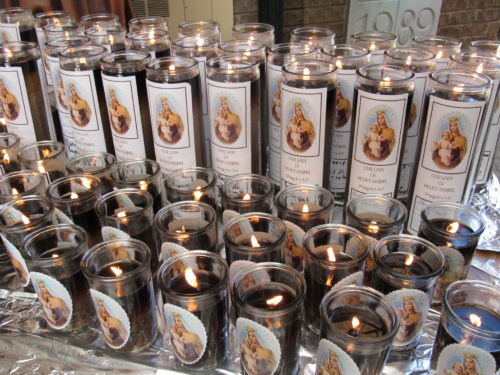 Amy Ferraro, a parishioner for 40 years, has a great devotion to Our Lady. “The Blessed Mother always seems to intercede for me,” she smiled. Ferraro has volunteered at the feast since it first began, giving time to her parish and community. Like many others in attendance, Bishop DiMarzio has a great devotion to Our Lady of Mt. Carmel. His presence at the feast goes beyond his ministry as bishop – the event also holds personal significance as he honors his cultural tradition. 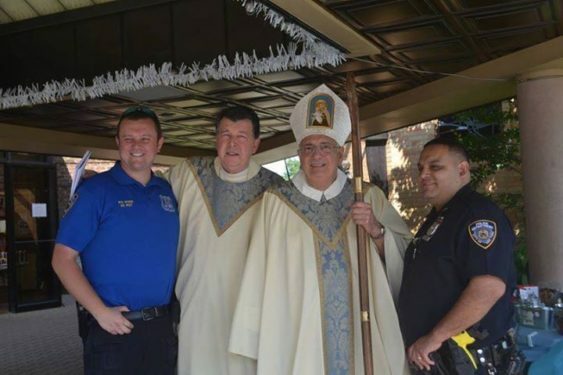 As an Italian-American, Bishop DiMarzio loves to partake in festivities connecting his faith and culture. 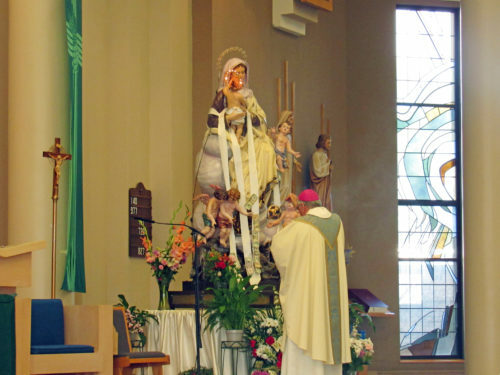 Throughout his ministry, Bishop DiMarzio has carried with him the message of Our Lady of Mt. Carmel – the importance of prayer. The bishop expressed his hope that others will feel the power of the Blessed Mother in their own lives, just as he has felt her in his. “She is so powerful and has done so many great things,” he said. The feast of Our Lady of Mt. Carmel has become an event that brings together people of all ages, languages and cultures to celebrate their faith and the Blessed Mother. Christine Frangipani, a devoted volunteer and parishioner, cannot wait for next year’s festivities.